My name is Mark Polk and I am the owner of RV Education 101® and RV Consumer. Many years ago I had concerns about the lack of RV safety awareness and educational material available to you, the RV consumer. To help improve on educating RV owners and RV enthusiasts I started RV Education 101. 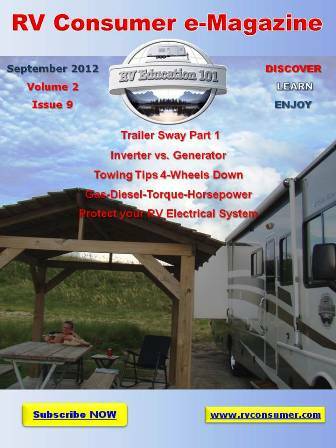 We produce RV training DVDs and publish books and e-books on every RV topic imaginable. I am proud to say that over the past 15 years we have helped educate millions of RV owners on how to safely and properly use, maintain and enjoy their RVs. While attending a trade show last year one of my colleagues said, “You know, you’re like the Bob Villa of the RV industry.” I replied back saying, “No, I’m the Mark Polk of the RV industry.” That conversation got me to thinking about the only thing we haven’t done is start a RV DIY channel for all the do-it-yourselfers out there. Between our RV101.tv site and our RV Education 101 You Tube channel we have over 400 in-house produced RV how-to and RV product videos posted, with more than 4,600,000 video views. But we did not really concentrate on the DIY perspective. So here it is, our RV DIY channel. Our goal with this project is to help other RV owners and RV enthusiasts tackle some RV projects, that without a little help they might otherwise have thought they couldn’t do. Of course if you are not comfortable doing some of these DIY projects yourself you should take it to a qualified RV service facility to have the work done. RV Education 101® is your premier provider of professional RV how-to instruction training videos, DVD’s, books, e-books and qualified RV information on using and maintaining a Recreation Vehicle. RV Education 101 was founded over 15 years ago by Mark Polk, who started in the RV industry as a teenaged apprentice technician. “You could say I was bit by the RV bug early on” Polk explained. Mark has a very extensive RV background working in RV service, sales and management. He has a degree in Industrial Management Technology and retired from the Army as a Chief Warrant Officer Three Maintenance Technician. His 30 plus years of experience in maintenance includes working as an RV technician, a wheeled vehicle and power generation mechanic, an automotive maintenance technician, Battalion and Brigade level Maintenance Officer, an RV sales manager and in the RV finance department as the Finance & Insurance manager. RV Education 101 was quickly labeled as the go to resource for RV owners and enthuiasts. With hundreds of thousands of training and informational DVDs and books sold, and his many TV appearances as the RV Savvy Guy, Mark is recognized and respected in the RV Industry as the authority for everything RV.